Tossing a steak on the grill is as American as our favorite sport. Even with higher prices, when Americans choose to splurge for summer barbecues, a thick juicy steak is still the protein of choice. When home cooks are looking to impress a hungry crowd, but also want to watch their budget, a baseball cut top sirloin steak from Harris Ranch is a winning strategy. The baseball cut gets its name from its rounded shape. This steak is cut from the center of the top sirloin. 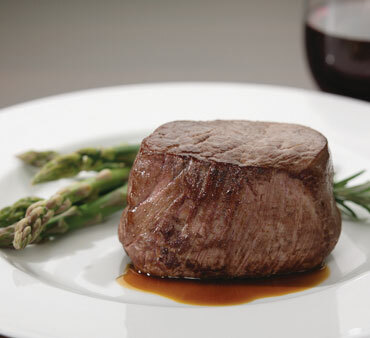 It’s lean, thick and flavorful, similar to filet mignon, at a smaller price. A Baseball Cut steak is not commonly found in a grocer’s meat case but the cut can be requested from a local butcher. Harris Ranch recently served 400 baseball cut top sirloin steaks at a VIP party for the Sonoma Country Summer Music Festival in Santa Rosa, CA. As with most steaks, the secret is to cook them to the right temperature using a good meat thermometer. Remember the temperatures will rise a bit once you take the steak off the grill to let it rest. If you don’t have a meat thermometer, feel it with your fingers. If the steak is very spongy it will be rare. Medium will have a firmer feel and well done will be very firm. Seasoning the Baseball Cut steak will also win big points. Try using Harris Ranch’s trusted recipe for Pepper-Herb Rub. Combine all ingredients; mix well. Using your hands, rub the mixture over the exterior of the steak. Makes enough to season 2-pounds of beef. Established in 1937, Harris Ranch today is an integrated family of companies and one of the largest family-owned agribusinesses in the nation. Located in California’s Central Valley, Harris Ranch sources, feeds and humanely processes all our beef. Few, if any, other beef companies control all aspects of production. From our world-renowned beef division to our diversified farming operation, Harris Ranch produces the highest quality products for foodservice, retail outlets and ecommerce. Our certified Angus beef and farm-fresh vegetables are showcased at the legendary Harris Ranch Inn & Restaurant—one of the first and largest “Farm to Fork” dining and hospitality destinations in California.